Q: We noted that when State Councilor and Foreign Minister Wang Yi met with visiting Greek Foreign Minister Nikos Kotzias yesterday, the two sides signed a MOU on the cooperation under the Belt and Road, making Greece the first developed country in Europe to sign such MOU. How do you think of the significance of China and Greece bolstering their cooperation under the Belt and Road? A: State Councilor Wang Yi and Greek Foreign Minister Nikos Kotzias signed an inter-governmental MOU on Belt and Road cooperation yesterday, which is of positive significance to the bilateral relations between China and Greece and the cooperation under the Belt and Road. Just as State Councilor Wang Yi pointed out when meeting the press after their bilateral talks, the signing of the MOU on the cooperation under the Belt and Road could serve as a new high-power engine for China-Greece relations, which will inject strong and lasting impetus into practical cooperation between the two countries. The joint building of the Belt and Road will certainly become a new growth point for China-EU strategic cooperation. Greece makes a natural partner for cooperation under the Belt and Road as it is an important converging point of the overland and the maritime silkroads. In recent years, the cooperation on connectivity between China and Greece has achieved early harvests, which is epitomized by the Port of Piraeus. The global ranking of this port has been elevated to 36 from 93 in 2010. The 55 shipping lines with the port as their hub cover the neighboring region of the Mediterranean and connect continents around the world. There are 16 to 18 container freight trains bound to the Central and Eastern Europe from the port every week. The Port of Piraeus has directly contributed over 600 million euros to Greece's economy and generated more than 10,000 jobs. On a broader scale, the Eurasia continent is a key region for the development of the Belt and Road. In particular, against the backdrop of the rise of unilateralism and protectionism, the joint building of the Belt and Road stands as an important symbol of commitment to multilateralism and a useful exploration of reforming and improving global governance and advancing trade and investment liberalization and facilitation. Through strengthened cooperation under the Belt and Road between China and Greece and other European countries, the Belt and Road Initiative will be synergized with the Investment Plan for Europe and the European connectivity plan in an in-depth manner, linking the Asian and European economic circles. This is conducive to better leveraging the competitive strengths of European and Asian countries, accelerating the interconnectivity on the Eurasia continent and creating new room for Asian and European countries to seek common development through cooperation. Q: A panel of UN investigators has recommended that several senior Myanmar generals be prosecuted for genocide because of their role in the Rohingya issue. Does China agree with the findings of this panel? A: China has made clear its position on the Rakhine State issue many times. This issue has a complex background, historically, ethnically and religiously speaking. We maintain that the international community should continue to play a constructive role in promoting dialogue between Myanmar and Bangladesh, seeking a pragmatic solution to the issue, and ensuring long-term stability in the Rakhine State. Q: The commander of the US Navy's Fleet Forces Command Christopher Grady said that Russia and China are seeking to supplant the US as partner of choice among free and prosperous nations, and the US' sea control and power projection are being challenged by these two countries. The US has officially re-established the Navy's 2nd Fleet, as the days of competition at sea and challenges to its maritime security have returned. What's your comment? A: It has been nearly three decades since the cold war ended, but certain persons in the US seem still obsessed with the monologue of seeking rivals and even making enemies. To maintain regional and world peace and stability concerns the common interests of all countries and our shared future. We hope these persons will not get so deeply lost in their own drama. Q: Former Commander-in-Chief of the US Pacific Command Dennis Cutler Blair recently said that both Taiwan and Japan took the Chinese People's Liberation Army's activities in international waters near their "territory" as a threat. Taiwan should try to conduct simulated attacks to improve its combat readiness while the aircraft carrier Liaoning sails nearby. What's your comment? A: Taiwan is an inseparable part of China. I wonder whether this former senior official from the US military is trying to help or harm the Taiwan side by offering such advice? If you are interested in what military implications his advice may have, I would advise you to follow what our defense ministry will say at their press briefing the day after tomorrow. Q: The FOCAC Beijing Summit is less than one week away. Can you tell us exactly how many African heads of state will be attending? 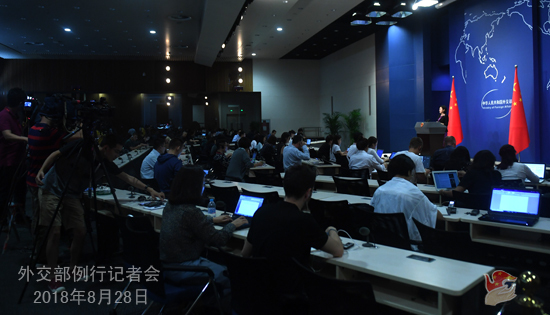 A: State Councilor and Foreign Minister Wang Yi already briefed Chinese and foreign media on the upcoming FOCAC Beijing Summit. Beijing is all geared up to welcome the arrival of African leaders. This summit will be the largest-scale diplomatic event hosted by China this year and attended by the largest number of foreign leaders. Various African leaders and the chairman of the African Union (AU) will attend the summit, along with the United Nations Secretary-General as the special guest and 27 international and African organizations as observers. We will release the information in due course. Q: The 2018 Defense White Paper published by Japan's Ministry of Defence said the DPRK's military activities pose the most serious and pressing threat the nation has faced. It also outlined concerns about China's military expansion and "territorial ambitions". What's your comment? A: Your question comprises two parts. As to the evaluation of the current situation on the Korean Peninsula, we support the US and the DPRK in accommodating each other's legitimate concerns, showing sincerity and flexibility and advancing the political settlement of the Peninsula issue in accordance with the consensus reached between the two state leaders at their Singapore summit. Relevant parties shall encourage and support such endeavors, offering encouragement rather than pouring cold water on them. As to the contents regarding China in the latest version of Japan's Defense White Paper, you mentioned "expansion" and "ambition". I don't know whether this is the original wording in the document since I have yet to see this white paper. But we won't accept such words at all. Such labels as "expansion" and "ambition" can never be pinned on China. This white paper you mentioned made accusations against China's normal national defense development and military activities and pointed fingers at China's normal maritime activities, which is totally groundless and irresponsible. We hope the Japanese side will not try to seek excuses for its arms expansion. Instead, it should bear in mind regional peace and stability as well as the general interests of China-Japan relations, and do more to enhance mutual trust, contribute to the security of both sides and uphold regional peace and stability, rather than doing the opposite. Q: The US side recently called off Secretary of State Mike Pompeo's planned visit to the DPRK. Officials from the Japanese government said this move is out of justifiable reasons. 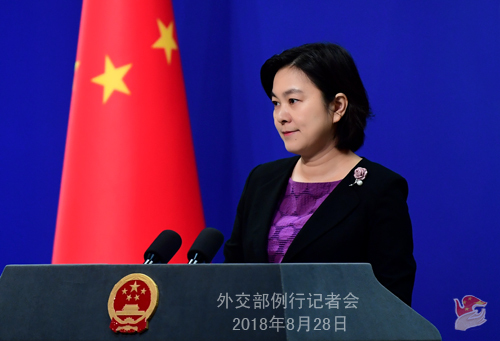 We noted that the US claimed the change of China's attitude on the Korean Peninsula nuclear issue recently has affected the settlement of the issue by the DPRK and the US through negotiations. What's your comment? A: My colleague Lu Kang already stated China's position on this issue on August 25. I would like to point out once again that the relevant claim by the US is entirely untrue and irresponsible. China's policy on the Korean Peninsula nuclear issue has been clear and consistent. It has stability and consistency. We remain committed to achieving denuclearization on the Korean Peninsula, resolving this issue through dialogue and consultation, and maintaining peace and stability on the Korean Peninsula. China has been vigorously promoting peace talks and mediating on the Korean Peninsula issue all these years. We have never taken credit when the situation improves or shifted blames when there are setbacks. We have all along been earnestly implementing our international obligations and playing a positive and constructive role in promoting the political settlement of the Korean Peninsula issue in a fair and objective manner and with a sense of responsibility for regional and global peace and stability. That is what we have been doing and will continue to do. The implementation of the consensus of the DPRK and US summit in Singapore seems to encounter setbacks at this point. The relevant party should seriously try to find the reasons in itself, rather than flip-flopping and blaming others. We support and hope that all relevant parties will follow the right direction of political settlement, engage in contact and talks, accommodate each other's legitimate concerns and show greater sincerity and flexibility, so that continuous progress will be made in the political settlement of the Peninsula nuclear issue. 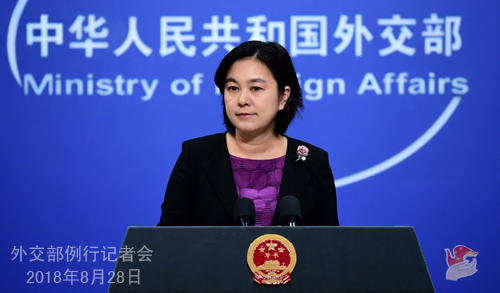 Q: As to the relevant recommendation on the Rohingya issue made by the panel of UN investigators, China has blocked action in the UN Security Council against Myanmar in the past. Will it continue to do so on this issue? A: You said that China has "blocked" actions in the UN Security Council on the relevant actions. I cannot agree with you on that. Like I just said, the historical, ethnic and religious background of the Rakhine issue is very complicated. Earlier on Myanmar and Bangladesh made some positive progress on properly resolving the Rakhine issue through dialogues, thanks to the concerted efforts of all parties. Considering this, the international community should continue to play a constructive role in promoting dialogues and negotiations between Bangladesh and Myanmar to properly settle the issue. Unilateral criticism or pressure will not help solve the problem. China has been playing and will continue to play a constructive role in properly resolving the Rakhine issue. Q: According to reports, the US Pentagon concluded after some analysis that China may change its policy of "no first use of nuclear weapons". In an annual reports on China's military power, the Pentagon said that though there is no clear proof that the Chinese leadership support the first use of nuclear weapons, the ambiguity surrounding China's nuclear modernization program is very likely to raise concerns. What is your comment? A: This groundless accusation made by the US Defense Department in its report does sound very ridiculous. Since the first day we owned nuclear weapons, the Chinese government has solemnly declared that China will not first use nuclear weapons at any time and under any circumstances. China remains committed to this pledge. We follow a nuclear strategy that is defensive in nature and always keep our nuclear strength at the lowest level required by maintenance of national security, thus posing no threat to any country. We firmly oppose these inferior tactics to distort China's policy intentions in an attempt to find excuse for the expansion and upgrade of their nuclear arsenals. Q: Earlier this morning, President Trump said that now is not the time to negotiate with China over trade. What are your views on that? A: China's position and attitude towards the relevant issue is consistent and clear. We believe that differences and disputes shall be resolved through dialogues based on parity, equality and good faith. Only such foundation ensures that talks are meaning and fruitful.